Here we are in the heart of Lent. We’re far enough into Lent that maybe I should be feeling my spiritual rhythm. I’m not quite sure I am. 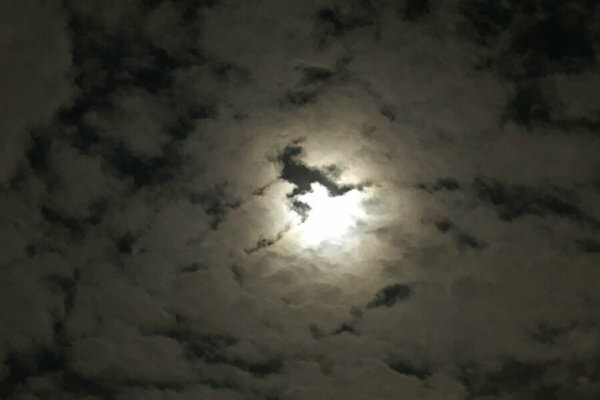 But I’ve had glimmers of light, beautiful moments of connection with Jesus, and moments when I am so grateful to be on this journey, even if I’m not sure I’m succeeding and staying as focused as I could. The Lenten activity I am most enjoying is pulling a name out of our prayer intention basket every day. I am continuing to fast from games on my phone, except on Sundays, and it is surprising how much that changes my daily routine. But I have so many other vices I should give up. The other morning one of the boys said, “Mom, maybe for Lent you should try to eat breakfast sitting down.” It’s an admirable goal. Eight years ago today we first saw our younger son’s photo. I will never forget the days we received the referrals for each of our sons, just as I will never forget the days we met them. You might think it would be impossible to fall in love with a photo, but I can’t tell you how often we looked at those photos, imagined what their lives were like in China, and felt tugged to get to them as soon as we could so we could start our time as a family together. I don’t know whether it’s comparable to the feeling parents have when they see an ultrasound or take a pregnancy test. But somehow you look at this picture of a child who’s living his life on the other side of the world and start to imagine the future you’ll share together. It’s absolutely extraordinary. One night this week when I was on my way to a lecture at Loyola University Maryland, where I work, I asked the boys if one of them would like to come along. My older son jumped at the opportunity. I explained a bit about the topic—the speaker was Mohsin Hamid, author of Exit West. As we slipped into our seats, my son started folding his program into some sort of origami masterpiece. But as the speaker started, our 11-year-old set it aside and watched with complete focus. Afterward, he told me he hadn’t understood everything, but he thought it was fascinating. He wants to go to all the lectures I go to from now on. 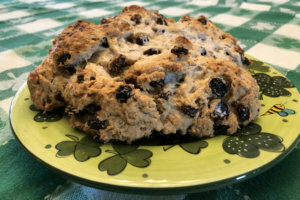 St. Patrick’s Day might be over, but I’m hoping it’s still Irish soda bread season. We still have buttermilk in our fridge, and I still have raisins on hand. 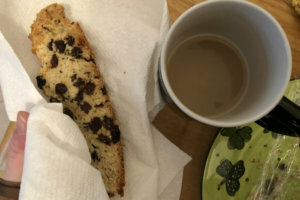 When it’s chilly and spring is right around the corner—but not here yet—there’s something so wonderful about a fresh, warm loaf of soda bread. Besides, it’s so easy to share a loaf of soda bread with a friend. I hope I’ll have time to make more this weekend. You may be wondering whether we bought anything from Ollie’s Outlet, since we went to the grand opening to get Brooks Robinson’s autograph this week. 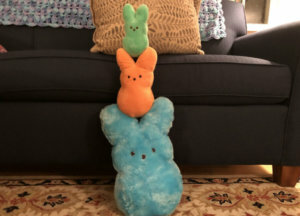 I did let the boys choose a few books, found a few pantry items we could use, and then our third grader picked out a couple stuffed Peeps with his hard-earned allowance money. The Peeps have happily joined the family. Apparently one of their favorite activities is balancing in a tower formation. It makes me wonder whether we should make a trip to the Peep Show in Westminster in a few weeks. At Loyola we celebrate Maryland Day on campus on the Friday before Maryland Day, which is the Feast of the Annunciation (March 25). Maryland Day is the anniversary of the day a Jesuit priest, Andrew White, S.J., said the first Mass in Maryland. 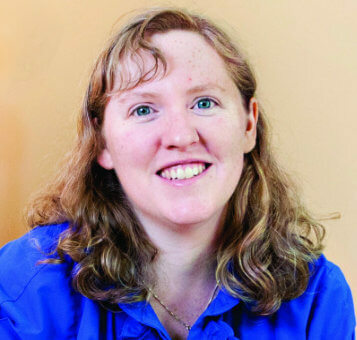 It’s also the day the University celebrates employees with milestone anniversaries. I marked 10 years at Loyola in November, so today I was honored along with colleagues who have been working there for 5, 10, 15…all the way up to 40 years. It was so much fun to see who else was celebrating today. My office isn’t on Loyola’s Evergreen campus, but I have found a desk there where I can work in an office full of welcoming colleagues. 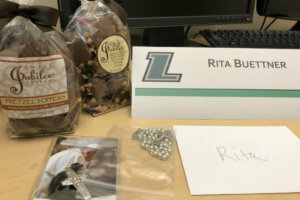 When I arrived at the desk that isn’t mine, I found a cardboard nameplate on my desk, candy, a rosary, a cross necklace, and a sweet note. I was so touched. Over the course of the day, I also received a pin, a lovely Black Susan corsage, a wireless printer, and many thoughtful comments from colleagues, but that unexpected welcome really set the stage for a beautiful day. 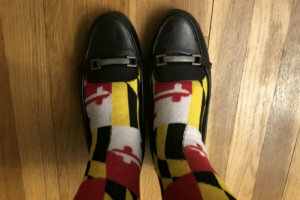 Because we were celebrating Maryland Day, I wore Maryland-flag socks. I wanted to dress formally because I knew photos would be taken, and my supervisor and I were the candle bearers for the Maryland Day Mass. But I also wanted to wear something Maryland-related, and socks seemed subtle but fun. I’m fairly sure it was the right choice. You can’t go wrong with Maryland-flag socks. 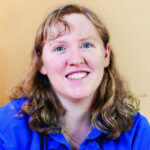 Read more quick takes on Kelly’s blog, This Ain’t the Lyceum, and have a wonderful weekend!